These days, flying coach on any airline is so awful that it’s practically an ad by default for the train. But Amtrak, America’s long-suffering passenger railroad (which in fact carried over 31 million riders in 2012) has actually been busy with some cool stuff on the marketing front lately. On the heels of a Twitter-inspired writer-in-residency program, Amtrak just announced a special social-media-influencer train, which will let its riders “engage with each other and explore the unique surroundings offered by long distance travel,” Christina Leeds, the railroad’s senior communications officer, told Adweek. Digital marketing, it turns out, is very good for a 19th century mode of travel. Everything started rolling in December, when novelist Alexander Chee (who likes to write while riding the New York subway) told Pen America, “I wish Amtrak had residencies for writers.” Perhaps without knowing it, Chee was speaking the hearts of thousands of writers, who relish train travel’s passing scenery and imposed downtime. One of them was Jessica Gross, who tweeted Chee’s interview to Amtrak’s social-media director Julia Quinn, who actually took the idea seriously. The railroad tried a test run with Gross on its Lake Shore Limited, encouraging her to tweet about her experience. Gross did, with photos. Earlier this week, Quinn told The New Yorker, “This is the most organic form of advertising for us—different people on our trains and exposing their audience to what long-distance train travel is like.” According to The Wire, Amtrak now plans to make the residency a regular thing—no doubt, freighted with hopes that its guests will tweet and blog aplenty about the joys of taking 21 hours to get from New York to Chicago. 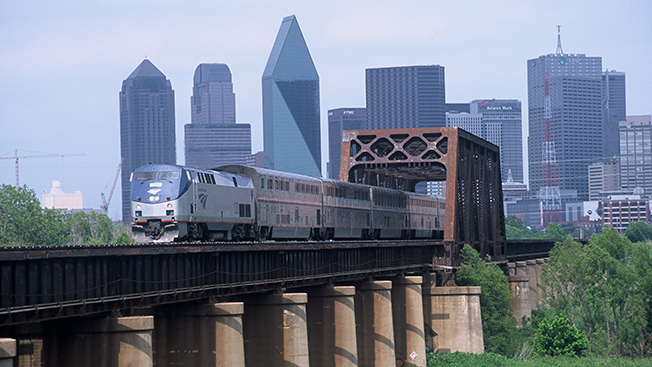 Meanwhile, Amtrak’s Texas Eagle will chuff out of L.A. bound for SXSW in Austin on March 5, designated as the first-ever Amtrak Live Train (#AmtrakLIVE.) A reserved observation car will carry the likes of Sarah Austin of Pop17 and Benni Leigh of Maker Studios, who’ve promised to live tweet and blog their hearts out for the 33-hour trip. Amtrak’s press release calls its digital VIPs “a diverse mix of adventurous thought leaders”—never mind that the real adventure on Amtrak means trying the microwave pizza. Seriously, though, the nation’s government-run passenger railroad has obviously coupled onto something important. Since the fun of train travel generally speaks for itself, the trick is getting those who can speak about it via social media to climb on board. And for this, Amtrak clearly has the ticket.